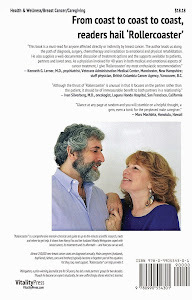 Zero Breast Cancer, a Marin County nonprofit, has launched it new website. With a spanking new logo and brighter color palette. All that, according to Rose Barlow, its executive director, reflects the organization's commitment to the next generation and an ongoing search for the most effective ways to help young women and men learn about the environmental causes of breast cancer — as well as to assist folks in becoming "aware of ways to reduce breast cancer risks." A mouthful, perhaps, but critically important. Regarding its mission, ZBC also notes that "in addition to primary prevention…recurrence prevention is becoming a priority." 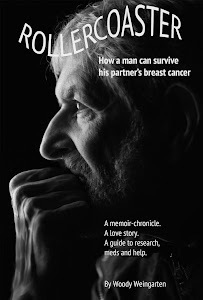 Although the site is new, Zero Breast Cancer is still, thankfully, promoting "Rollercoaster: How a man can survive his partner's breast cancer," a VitalityPress book that I, Woody Weingarten, aimed at male caregivers. That item appears on the ZBC site under the headline "Male caregivers need support, too" — and can be found by clicking on goo.gl/821pi7. If you check out the home page, by the way, you'll find another important plug — for a 6:30 p.m. April 6 talk by Kaiser Permanente researcher Marilyn Kwan, Ph.D., with the elongated title of "Lymphedema in Breast Cancer Survivors: What's at Risk and New Information on Racial/Ethnic Disparities." And the ZBC blog contains such informative items as "High Fiber as Teen Equals Lower Breast Cancer Risk," "New Study Shows Big Benefit of Breast Cancer Survivors Stopping Smoking" and "Feeling Bad about Our Weight is Unhealthy!" May 10, the organization will hold Honor Our Healers (a name change for the annual signature event from Honor Thy Healer). KGO's Cheryl Jennings will once again be the emcee, and the keynote speaker, Dr. Louise Greenspan, co-author of the book "The New Puberty," will reprise her recent TEDMED talk. Zero Breast Cancer, which just turned 21, is using its year-long anniversary to celebrate the fact that "breast cancer rates in Marin and California have continued to decline." In a personal email, Barlow told me this: "As we are now telling everyone — the very good news is that Marin breast cancer rates are way down. The bad news is that they are now just as bad as everywhere else in CA, the USA and in line with rates in other advanced societies with our first world lifestyle." Zero Breast Cancer, under its original name, Marin Breast Cancer Watch, twice honored me with awards — once as a healing partner for my wife, Nancy Fox, and once as a leader of the Marin Man to Man support group.